This contract funds WSU’s help with the implementation of the Collaborative Learning for Educational Achievement and Resilience (CLEAR) trauma-informed school response model at the Riverdale Avenue Community School in Brooklyn, New York. Developed by the WSU Child and Family Research Unit (CAFRU), CLEAR is a whole-school change model that helps school professionals gain the skills needed to support students who have experienced trauma (such as abuse, neglect, homelessness, and domestic violence) and to enhance social emotional learning. CAFRU will provide all school staff with three hours of initial training at the start of each academic year, as well as one-hour monthly trainings throughout the academic year to build specific skills through case-based learning. On-site and video coaching and consultation will provide additional support. This award provides funds for WSU Child and Family Research Unit (CAFRU) staff to implement the CLEAR (Collaborative Learning for Educational Achievement and Resilience) trauma-informed school response model at Betz Elementary and Salnave Elementary Schools in the Cheney School District. Developed by CAFRU, CLEAR is a whole-school change model conducted in on-site monthly consultation and professional development trainings provided by CAFRU staff, typically over a three-year implementation timeline. This award provides funds for WSU Child and Family Research Unit (CAFRU) staff to implement the CLEAR (Collaborative Learning for Educational Achievement and Resilience) trauma-informed school response model at Cheney High School in the Cheney School District. Developed by CAFRU, CLEAR is a whole-school change model conducted in on-site monthly consultation and professional development trainings provided by CAFRU staff, typically over a three-year implementation timeline. This contract provides funds for the WSU Child and Family Research Unit (CAFRU) to implement the CLEAR (Collaborative Learning for Educational Achievement and Resilience) trauma-informed school response model at Sunnyside Elementary School in the Pullman School District. CLEAR is the intellectual property of CAFRU. This award funds a two-year study to uncover the role of telomerase in repairing double-strand breaks, one of the most harmful types of DNA damage. Accurate repair of double-strand breaks is important for preserving genome stability and preventing tumor growth. It also impacts how tumors respond to radiation therapy and many chemotherapy drugs. Telomerase—an enzyme normally involved in preserving telomeres, the protective ends of chromosomes that keep cells from dying—has been shown to be involved in a process known as telomere sequence insertion (TSI). TSI is the indiscriminate addition of telomeric repeats at intra-chromosomal double-strand breaks. Previous studies have shown that TSI causes chromosome breakage, recombination, and rearrangement that can lead to genome instability. The goal of this study is to find the molecular mechanism that suppresses TSI to ensure accurate repair. In addition to providing novel insights into double-strand break repair and genome instabilities, this research may lead to the development of new cancer treatments. This project funds an investigation into the effects of multiple doses of a non-toxic naturopathic compound on stress-induced insomnia in rats. Stress-induced insomnia will exploit the male cage exchange method, which involves placing rats in a soiled cage that was inhabited for one week by a different rat. Polysomnography recordings will be conducted to measure sleep quantity and quality in rats receiving the compound vs. control rats. If the compound’s hypothesized effects are confirmed by EEG recordings, its site of action will be determined. The project outcomes could lay the groundwork for the development of new drugs to treat insomnia in humans. This is a new grant that funds a continuing line of research on how the built environment influences individuals’ lifestyle behaviors and health. The study uses sets of identical adult twins who grew up together as children but now live apart to test the hypothesis that exposure to an “obesogenic” environment negatively influences physical activity and eating behaviors and leads to changes in genetic expression that are associated with obesity. An example of an obesogenic environment would be a sprawling suburb in which cars are the only viable transport option and fast food restaurants and strip malls are numerous. This award funds a two-year study examining the role of neurotrophins in the regulation of sleep. Neurotrophins are a family of proteins that regulate the survival, development, and function of neurons, or nerve cells. It has been hypothesized that they play a central role in sleep regulation: brain neurotrophin mRNA and protein levels increase with wakefulness, and administration of neurotrophins increases sleep time and intensity. Neurotrophins also govern cellular processes linked to sleep function, including brain cell survival and synaptic plasticity. However, the precise role of neurotrophins remains unclear. The study will use a mouse model to determine the role of three neurotrophin-TrK receptors on the sleep-wake balance and on genome-wide changes in the brain that accompany the accumulation and discharge of sleep need. Risk assessment tools have been implemented in nearly every state and in the vast majority of juvenile justice agencies to guide decisions on diversion, case management, supervision, and placement of juvenile offenders. However, little research regarding the methods of risk assessment development has been translated to the field. This study will seek to isolate, test, and evaluate the relative impact of seven variations in how risk assessments are developed to determine their impact on the predictive performance of risk assessments. It will provide the Office of Juvenile Justice and Delinquency Prevention, the field, and practitioners using and implementing risk assessments with an understanding of development variations and methods of tool customization to optimize predictive performance for their local jurisdiction and youth population. This project seeks to improve the Positive Achievement Change Tool (PACT) risk assessment tool and the related operation of Juvenile Court-based probation in Washington State. It involves the development of a needs assessment—as a supplement to risk assessment—to help reduce youths’ overall risk to reoffend. It also encompasses a responsivity assessment that will help identify characteristics in offenders—such as risk level, needs profile, gender, age, race, and ethnicity—who are likely to experience a reduced risk of recidivism following participation in specific interventions. Findings from the responsivity assessment could guide eligibility considerations, identifying youth most likely to complete and succeed as a result of an intervention. This is a contract with the City of Spokane that provides funds for WSU to evaluate the operation and outcomes of the city’s community court. A community court is an alternative court for offenders of low-level crimes that aims to cut down on recidivism by helping address participants’ underlying issues, such as homelessness and substance abuse. The evaluation will assess whether the city’s community court team has implemented the model as intended and is targeting the correct population for the program. It will also determine whether community court participants have better outcomes than individuals who participate in the traditional system, looking at factors such as recidivism, treatment completion, maintaining stable housing, completion of community service, and jail usage. This concerns a series of awards to fund Supplemental Nutrition Assistance Program – Education (SNAP-Ed) programming in Asotin, Benton, Franklin, Grays Harbor, King, Mason, Lewis, Pierce, Thurston, and Walla Walla Counties. SNAP-Ed is a federal program funded through the Farm Bill that supports evidence-based nutrition education and obesity prevention in individuals and families eligible for Supplemental Nutrition Assistance Program (SNAP) assistance. WSU staff will deliver SNAP-Ed through local county extension offices. Goals include improving dietary quality, food resource management, and physical activity in low-income individuals, families, and youth. This grant funds a project to conduct an evaluation of different methods of implicit bias training. The goal of implicit bias training is to improve police decision making by reducing stereotyping attitudes, judgments, and beliefs. In partnership with the Ohio Peace Officer Training Academy and the Cleveland Police Department, this new study will look at 400 officers assigned to patrol in the Cleveland metro area. Officers will be assigned to one of four groups and will receive either classroom-based implicit bias training; simulation-based implicit bias training; both types of training; or no training. The study will compare each of these groups to determine the impact implicit bias training and training methods on police decision making and outcomes of police-citizen encounters. Researchers will evaluate body camera footage, citizen complaints, results of surveys on arrestee perceptions; and survey and focus group results on officers’ perception of training effectiveness. This award funds travel related to Teena McDonald’s service as a member of the Washington State Office of the Superintendent of Public Instruction’s Professional Education Advisory Board. This subaward provides five years of funding for Michael McDonell and others at WSU to evaluate the effectiveness of Catholic Charities of Spokane’s Rising Strong program. Rising Strong is a treatment program that serves families with children at risk of entry to foster care due to abuse or neglect by parents with substance abuse disorder. The program provides parents and children with housing and an array of other services to help them recover, heal, and thrive. The evaluation team will collect data to determine whether Rising Strong is associated with increased child well-being, parent recovery, and family stability, as well as enhanced child safety, as compared to a matched group of families not participating in the program. This study will examine the role of the follicle-stimulating hormone (FSH) receptor in prostate cancer cells. The FSH receptor is a protein receptor that interacts with the follicle-stimulating hormone (FSH) and is necessary for the hormonal functioning of FSH. Earlier studies have shown that FSH can stimulate the proliferation of cancer cells in human cell cultures. Higher levels of FSH in plasma are correlated with prostate cancer metastasis, and FSHR expression is elevated in human prostate cancer cells and tissue specimens. This study will further explore the relationship between FSHR expression and prostate cancer cell proliferation and identify the underlying mechanisms. The results of this study may ultimately lead to new treatments for prostate cancer. This three-year grant-funded project will help WSU Spokane offer enhanced support to students who are victims of domestic or dating violence or stalking. The funding will allow the campus to improve coordination of prevention efforts among departments; improve training for campus administrators and security and judicial board personnel; strengthen victim services programs in collaboration with the YWCA; increase services to underserved populations and those facing barriers to accessing services; and develop programs that address the specific needs and challenges of students training to become nurses, doctors and pharmacists. This is a subaward of an NIH-funded project to improve the clinical and translational research skills of Alaska Native/American Indian investigators and faculty through targeted training and mentoring opportunities. This helps to ensure that health research at the Southcentral Foundation is carried out in a manner that is culturally, scientifically, and ethically sound. It may also help increase the number of Alaska Native and American Indian investigators within the community. This NIH Mentored Research Scientist Development Award provides the PI with funds to start a line of research on the role of sleep in Autism Spectrum Disorder (ASD), the most prevalent neurodevelopment disorder in the U.S. Sleep problems have been shown to occur at a much higher rate in ASD than in typical development. They predict the severity of core symptoms of ASD—such as repetitive behaviors and social/communication deficits—as well as associated problems, such as tantrums and aggression. This research will specifically look at the role of Shank3—a gene that has been associated with ASD. Deletion of the Shank3 gene leads to Phelan McDermid Syndrome, a rare disease that is often accompanied by ASD. This study will build on preliminary work that showed that mice with a mutated Shank3 gene slept less after they had been sleep deprived than mice that did not have the mutation. It will attempt to determine whether this is due to decreased sleepiness or difficulties falling asleep. The research would increase scientists’ understanding of the mechanism that underlies sleep disturbances in individuals with ASD and may eventually lead to new interventions that could improve quality of life for patients and their families. This contract funds the development and validation of the Flexible Attention Control Task (FACT), a new test of cognitive performance to demonstrate performance deficits in patients with sleep deficiency. This is a subaward that funds WSU’s participation in the EMPOWER study led by the University of Cincinnati. EMPOWER is a five-year study of 400 non-cancer patients who are being treated with long-term opioid therapy at the University of Cincinnati Health and Duke Health. The study will look at whether use of an online pain management program, the Goalistics Chronic Pain Management Program, could help these patients reduce the amount of prescription opioids they take. The study will compare opioid use and pain outcomes between program participants and a control group who receive treatment as usual. This subaward provides continued funding for Dr. Buchwald to co-lead the GUMSHOE program, one of four professional development-training programs in the National Research Mentoring Network for a Diverse Biomedical Workforce. Funded by the National Institutes of Health, the network was created to address the unmet need for greater diversity in the biomedical and biobehavioral research workforce. GUMSHOE (Grantwriting Uncovered: Maximizing Strategies, Help, Opportunities, Experiences) provides twice-yearly grant writing workshops and mentoring to early career faculty from diverse backgrounds wanting to prepare an application for NIH funding, with a particular focus on projects in underserved or rural communities. This subaward renews the funding for WSU’s role in a study to assess food insecurity among Native Americans and increase the availability and intake of vegetables and fruits in convenience stores in two tribal nations of Oklahoma. The study outcomes will inform the development of a multimedia manual to guide food environment changes among tribes nationally. 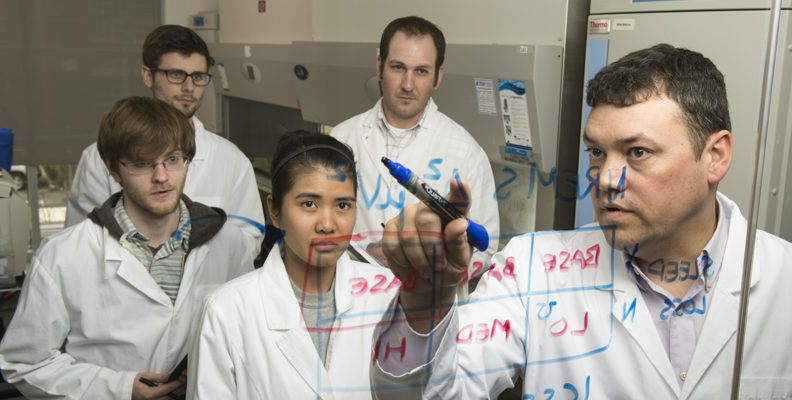 This subaward renews the funding for WSU’s role in an NIH center grant to establish a satellite core of the Alzheimer’s Disease Research Center in Seattle. The WSU team will conduct a research project that will recruit participants of the Strong Heart Stroke Study to examine stroke, vascular brain injury, cognitive function, and Alzheimer’s disease and their consequences in about 100 elder American Indians. The Strong Heart Stroke Study is a follow-up study to the Strong Heart Study, a large longitudinal cohort study examining cardiovascular disease and its risk factors in American Indians. This is continued funding for WSU’s assistance in a multicenter study to measure risk factors for long-term physical and cognitive dysfunction in chronic critical illness. A substantial number of critically ill patients experience persistent organ failure leading to chronic critical illness. The majority of these patients die within a year. Many survivors must cope with severe, long‐term physical and cognitive limitations, which present a significant clinical, emotional, and economic burden. The subcontract provides funding for Chaytor to oversee cognitive and functional outcomes from the study. The project will provide new tools for patients and clinicians to understand chronic critical illness, informing bedside decision making and future medical and resource interventions for this extremely high‐risk patient group. This is renewal funding for a two‐part study to assess the associations between environmental exposures and health outcomes, using a new wearable device for measuring environmental toxicants called the Portable University of Washington Particle Monitor (PUWPM). The study will use pairs of adult twins from the community‐based UW Twin Registry to explore the associations between exposures to air pollution, noise, and other environmental factors; physical activity, diet, psychosocial stress, and clinical outcomes such as blood pressure, height, weight, and waist circumference; and biological markers related to inflammation and stress. It may ultimately lead to new insights linking environmental, behavioral, and genetic aspects of chronic disease. This represents renewal subaward funding for a pilot project of the Sterol and Isoprenoid Diseases (STAIR) consortium, a collaborative group of investigators dedicated to clinical research on disorders related to cholesterol and other sterol and isoprenoid metabolism. This project evaluates cell surface biomarkers in patients with Hyper IgD syndrome (HIDS), a periodic fever syndrome resulting from a defect in the cholesterol pathway, mevalonate kinase deficiency. A mouse model of this disorder developed by the PI has shown innate and adaptive immunity abnormalities that could be causing the periodic fever and elevation of IgD. This study will ascertain whether the observed defects are reproduced in HIDS patients. If so, these anomalies may serve as surrogate biomarkers during clinical treatment to assess improvements and outcomes. This is supplemental funding for a project that provides nutrition education and obesity prevention services to individuals and families eligible for Supplemental Nutrition Assistance Program (SNAP) assistance in KING County. This is continued funding for a project to determine the cellular mechanisms that underlie sleep homeostasis, the process that regulates the pressure to sleep based on prior wakefulness. Since impaired sleep homeostasis can cause poor sleep, it’s important to understand the cellular processes involved in sleep homeostasis. This study will look at glial astrocytes, which are found throughout the brain and may play a central role in sleep homeostasis. Astrocytes drive how the brain tries to compensate for sleep loss. Because the chemical signaling between glial astrocytes is associated with changes in intracellular calcium, this study will use a mouse model to test the hypothesis that intracellular calcium dynamics contribute to the accumulation and discharge of the pressure to sleep. Study results will provide new insights into how glial astrocytes affect sleep homeostasis and will bring scientists one step closer to understanding the underlying causes of abnormal sleep. This is renewal funding for a grant that funds activities related to the evaluation of the Washington State Department of Behavioral Health and Recovery’s first episode psychosis program in Yakima County. WSU will lead the quantitative evaluation of the program and will work with the University of Washington to conduct the qualitative evaluation. The first episode psychosis program was launched to enhance the recognition of early signs and symptoms of psychosis so that effective treatment can be started promptly. This award provides continued funding for Sterling McPherson to provide statistical expertise and data analysis for a project funded by the Veterans Affairs Health Services Research and Development Service. The project seeks to examine and compare changes in pain intensity and pain treatment utilization following the discontinuation of long‐term opioid therapy among veterans with and without substance use disorder diagnoses. This contract provides renewal funding for WSU to assist Ringful Health in developing an interactive education program and bedside decision tool for nurses related to Neonatal Abstinence Syndrome, a group of problems that occur in newborns who were exposed to addictive illegal and prescription drugs while in the womb. This grant provides supplemental funding from the federal TRIO programs for the Upward Bound program. Upward Bound is designed to generate the skills and motivation necessary for success in education beyond high school among young people from low‐income families and families where neither parent has acquired a bachelor’s degree. Upward Bound provides program participants with fundamental support in their preparation for college entrance. This Upward Bound project housed at WSU Spokane focuses on four small high schools in Ferry and Stevens Counties. This contract provides renewal funding for the Spokane Math Engineering and Science Achievement (MESA) program. The program builds a pathway to college and careers in science, technology, engineering, and mathematics (STEM). MESA develops programming and initiatives to improve diversity and retention, with an emphasis on traditionally underrepresented students in STEM fields, including African Americans, Native Americans, Hispanics/Latinos, Pacific Islanders, and women. This is renewal funding for a collaborative grant with Emory University to study outcomes in Duarte galactosemia. Duarte galactosemia is a disease that limits the ability to break down galactose, a sugar found in breast milk and animal milk. The study will examine the prevalence of speech, motor, cognitive, and other developmental disorders in children with Duarte galactosemia. The goal is to develop evidence‐based recommendations for parents of children who have this rare and little studied disease. This is continued funding for a five‐year project to study how neutrophils—the most abundant type of white blood cells in the bloodstream—could be used as a vehicle for delivering therapeutic nanoparticles to specific parts of the body. This work may help design new drugs to treat inflammatory disorders underlying acute and chronic diseases, including cancer. Specifically, the study will look at the efficacy of using neutrophil‐mediated nanoparticle transport to treat acute lung injury, a devastating disease that cannot currently be treated with drugs.